Your skin can change significantly when you are pregnant and with hormones fluctuating, this can lead to skin dryness and sensitivities, not to mention being itchy from all that stretching. Beautifully scented with our special blend of pure essential oils recommended for use during pregnancy, includes mandarin, tangerine and frankincense pure essential oils, helps smooth lines and scars, improving the overall appearance of the skin and fades any existing stretchmarks. 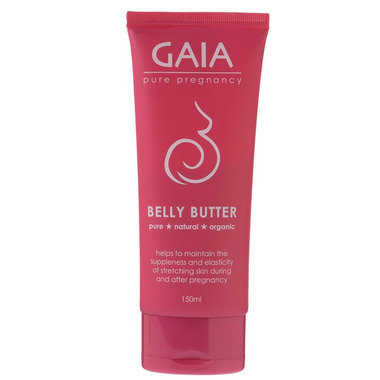 Gaia Pure Pregnancy Belly Butter will leave your baby bump soft and supple. It can also be used on breasts, thighs and bottom, or anywhere extra toning is required. The first of many products in the pure pregnancy range, designed to minimize the effects pregnancy can have on your body. When your beautiful belly shows signs of expanding, gently massage Gaia Pure Pregnancy Belly Butter into your belly, breasts and thighs twice daily during pregnancy and for 12 weeks after the birth.